It’s hard to do your banking when the nearest branch is a day away and you don’t have any electricity. 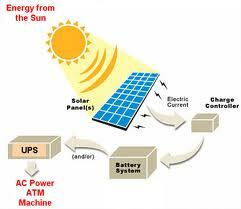 These new cash machines run on the sun’s power, and can bring some modern banking to truly out-of-the-way places. For many villagers in rural areas of India, personal banking is pricey in ways American could never imagine. First, there is the cost of reaching the nearest branch. Bus fares are expensive, and a day’s labor is lost in the journey. Simply installing ATMs in villages that don’t have reliable electricity (or don’t have at all) is problematic, while building bank branches in every hamlet is out of the question. 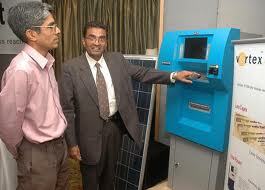 Indian engineering company Vortex has taken on the challenge by creating solar-powered ATMs. Superficially similar to the cash dispenser in your corner convenience store, these rugged little bank tellers are a distant species altogether. The Gramateller ATM is lean, efficient and designed to live almost anywhere humans do. It carries its own solar panels, alongside four to eight hours of battery storage. Despite the ability to operate in temperatures as high as 122 degrees Fahrenheit, it never needs cooling, unlike most ATMs. 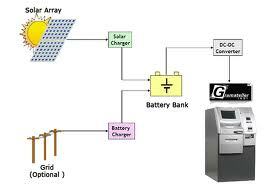 Clever engineering also means it’s 90% more efficient than conventional machines, consuming about $10 of electricity per month in India. The ATM also comes with a fingerprint identification system, making it easy for those unfamiliar with digital devices to withdraw cash. So far, Vortex has deployed about 450 across almost every state in India, mostly in small towns about 60 kilometers from bank branches, reports Yale Environment 360. Vortex officials say they plan to install about 10,000 more within the next two years, while an international expansion is also underway. Convenience cash may never be far away. 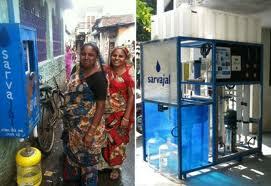 The poor living in far flung locations just need to be able to earn enough of it to withdraw.